a Kingdom / Grand Duchy / Duchies. 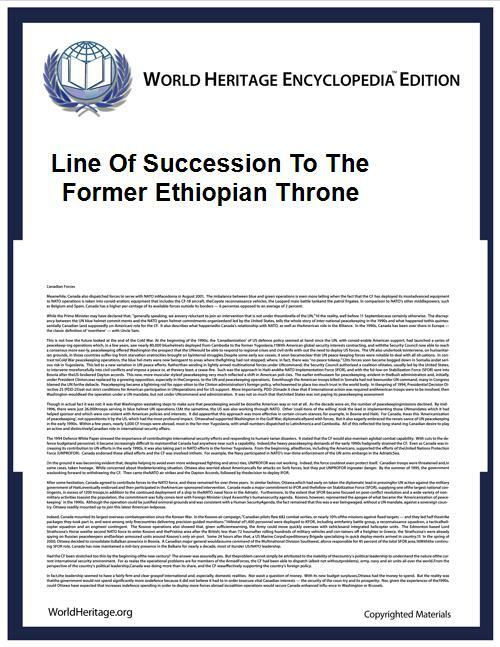 The line of succession to the Ethiopian throne is described in the first section of the 1955 Revised Constitution of Ethiopia. Traditionally the succession was limited to descendants of Makeda Queen of Sheba and King Solomon of the Israelites. The 1931 and 1955 Constitutions formally established a legal order of succession that placed the Imperial throne in the reigning Shewan branch of the Imperial dynasty, giving precedence to the line of Emperor Haile Selassie I. In brief, the title of Emperor may pass only through male descendants of Haile Selassie I, through the oldest male line before the younger. Other qualifications are that they be born in lawful wedlock, be an Orthodox Christian, and not be married to a foreigner or against consent of the Imperial Family. In the event that there were no qualifying male descendants of Haile Selassie, the nearest male relative who is descended from Sahle Selassie, King of Shewa, would then be heir. According to most interpretations this would place the throne in line of Emperor Haile Selassie's brother Dejazmatch Yilma Makonnen, followed by the family of his cousin Ras Imiru Haile Selassie. In March 1975, the monarchy was abolished by the Derg, the military junta that had forcibly taken over during a Communist revolution. The Derg by its own authority abolished all royal and noble titles by proclamation at that time. The current Constitution of the Federal Democratic Republic of Ethiopia makes no provisions for a monarchy. The Crown Council of Ethiopia considers Crown Prince Zera Yacob Amha Selassie to be Head of the Imperial House. Although the current Ethiopian government regards members of the Imperial family as private citizens, they do recognize their royal and noble titles as a matter of courtesy, effectively rescinding the abolition of those titles by Derg regime. Foreign royal courts have continued to accord members of the Ethiopian Imperial family their titles throughout the period following the fall of the Ethiopian monarchy in 1974.